I garden in a temperate climate, where Bougainvillea gets frosted in winter, and Bromeliads need shelter. I haven't even got a heated conservatory room full of beautiful tropical plants. 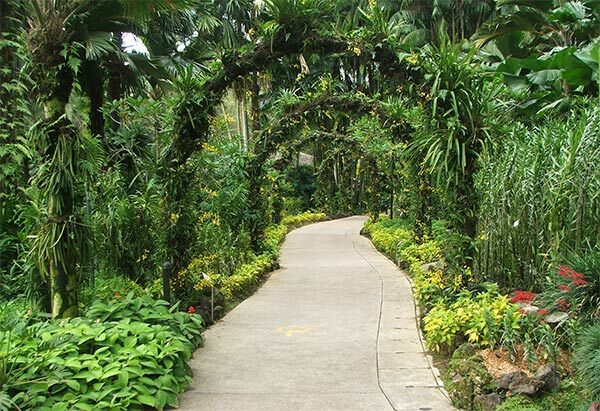 Meeting the plants at Singapore's Botanical gardens was going to be very exciting! So after hearing so much, I finally got to meet the tropical, botanical, horticultural inhabitants of Singapore's Botanic Gardens - the plants - in person. The collection was rich and diverse, as the following Google-researched statistics show. There are about 3,000 species of tropical and subtropical plants, 250 species of palms in Palm Valley, 6 hectares of natural remnant rainforest containing over 200 species of plants ( and lots of little striped squirrels)... And I haven't even started to mention the species and hybrid orchids - best leave that for another page! Unfortunately - or fortunately? - I didn't take 3000 photographs of flowers, leaves, and trees with their labels. 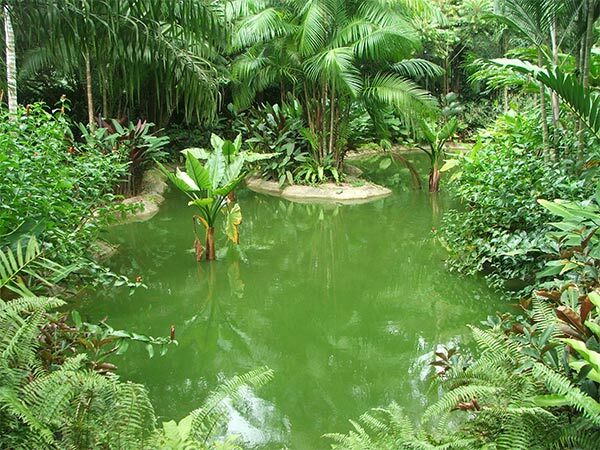 Some plants which really impressed me may be boring and old-hat to more tropically experienced visitors. Sprinkled dots of colour and the fluff of perennials and roses were, of course, noticeably absent. Flowers, when present, tended to be bright and gaudy, like parrots, with flashes of red, brilliant blue, and hot yellow. Heliconias were personal strangers to me - but what beautifully contorted flowers these plants have! And this time I had no trouble with identification - the path was called Heliconia Walk - good thinking! Named hybrids, subtly different in colour, were lined up on the grass, orderly groups at a Heliconia roll call. The colour with the greatest impact was green, ever-present in the strong, sculptural foliage, well watered in this lush climate. Look at me! shouted a tree - an Umbrella Palm - with huge ribbed green leaves, rain-sheltering building materials for a Robinson Crusoe island house. The plantings were dominated by different species of palms. 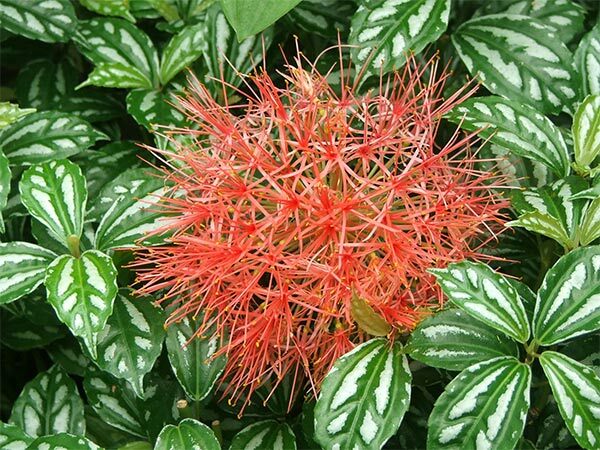 A red-trunked palm has been chosen for the Botanic Gardens logo, and these were planted in various places throughout the gardens. 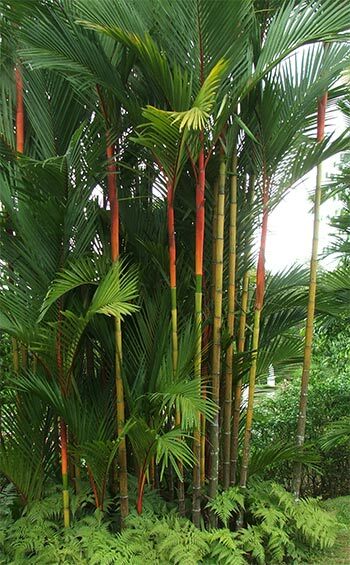 The official sign calls them a 'Sealing-Wax Palm'. I prefer the pet-name 'Lipstick Palm' by which a local visitor spoke of them. 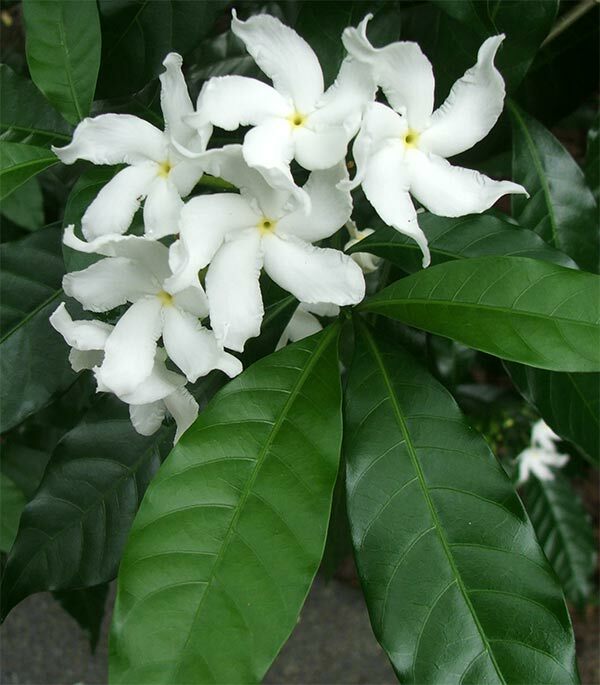 There were also important heritage trees, far too huge to photograph, like the famous Tembusu (Fagrea fragrans). It's ancient, a lone survivor older than the gardens themselves. 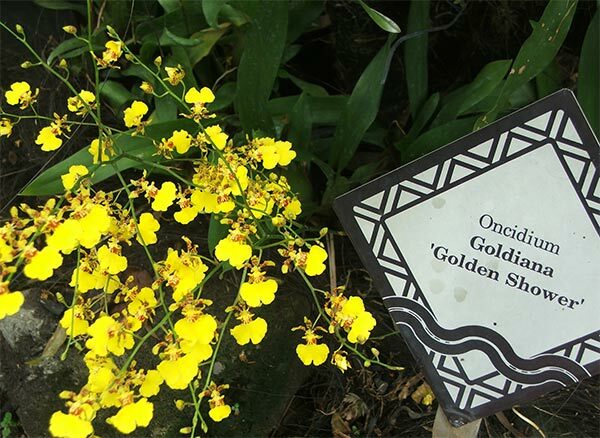 Singapore's Gardens are well known for their collection of species and hybrid orchids. I loved meeting these aristocratic flowers, and enjoyed the way they were planted - staying in their pots, but massed in blocks to cover the ground with colour. The Ginger Garden was interesting. This was my first meeting with many of the members of this family (Zingiberaceae). I can't grow ginger in my garden. Even the boring types are banned, and alas I don't use ginger root in my cooking, so these plants have an exotic feel to me. 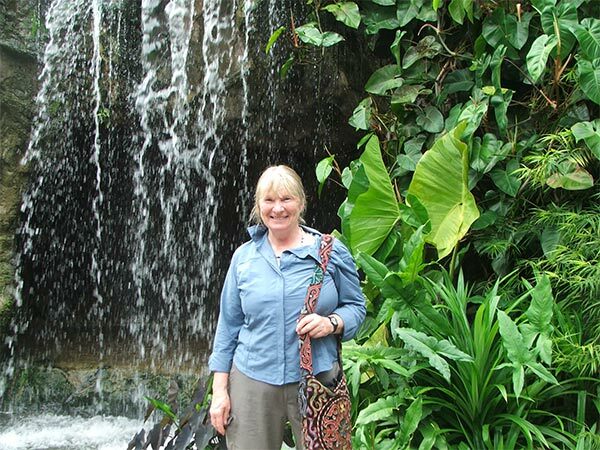 The waterfall at the entrance was the perfect spot for a hot tourist photograph, too. I've really enjoyed meeting R. Sabapathy from Singapore. 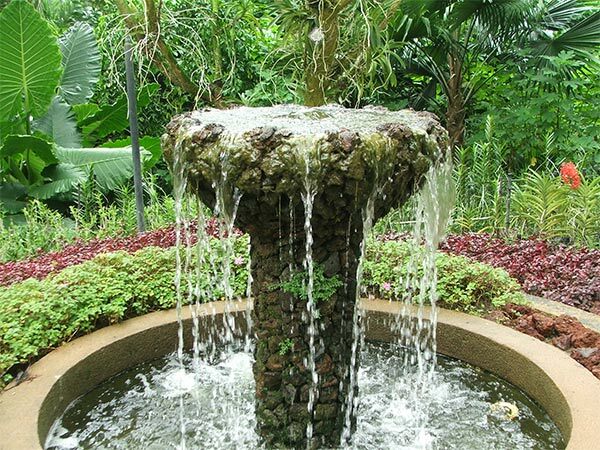 He has a wonderful collection of images of Singaporean plants - from trees you'll meet in the street to botanical garden treasures. And he's helped me with some plant names I got wrong. Thanks so much.